I love breakfast food. Just not… for breakfast. Is that totally weird and stuff? Or are you guys like that too? I mean, I’ll eat an egg on OR in anything. And cereal ?!? Pfffffft! I need a bowl a day. At least! And don’t even get me started on how much I love me some fraaaaaanch toast. No, really. Don’t get me started! But in the early am hours the only thing I want most days is to crawl back into bed. And once I realize that’s not happening. COFFEE. Always. But since we’re all real people here, I think we all know that coffee – as miraculous as it is – is not good, proper body fuel. At least not in the long run. This smoothie however, is. It totally is! And considering you can pulse it up in under two minutes, I say this smoothie is a total win. 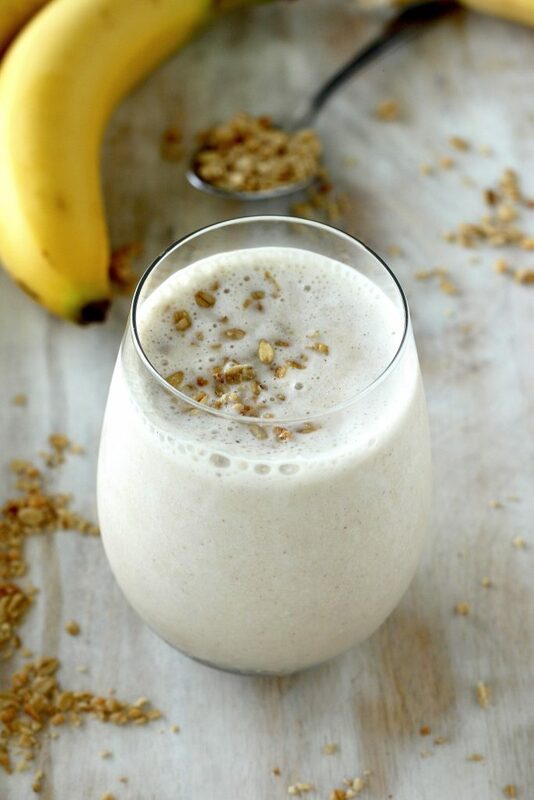 The Best and EASIEST Banana Honey Smoothie! 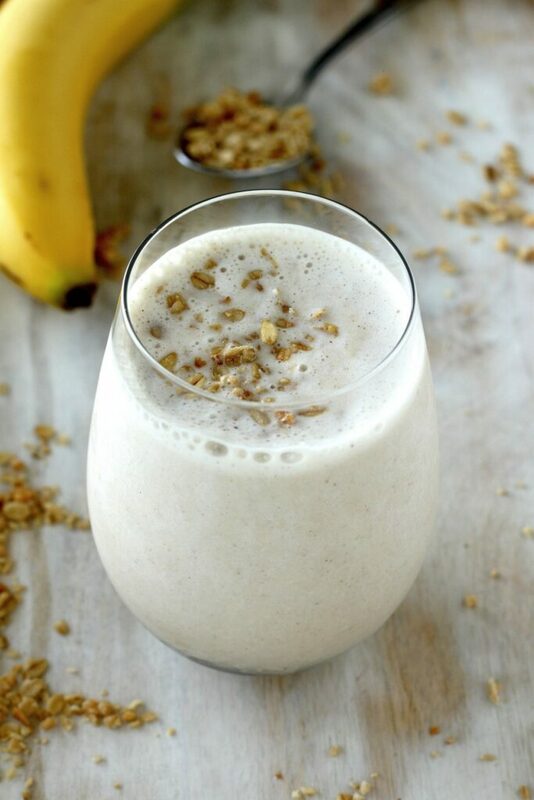 I love honey and banana, but never thought to combine them together in a smoothie. This sounds killer and I love that you used dates to sweeten things up! Perfect for a healthy snack on the go! Yum – I sure could use one of these right now! Breakfast is my fave! 🙂 This would be a welcome change from my usual dry cereal! This sounds like perfection to me! I love the dates…great idea! Oooh smoothies are so miraculous! I could totally go for one of those this morning. It just looks so decadent. This looks SO tasty! And I love how the sweetness is all from natural things. I love that there is almond butter in here…swoon. I love banana shakes! I’m always trying variations on it because it’s such a versatile drink. Honey and figs sound like an awesome addition. Definitely a must try! I am a breakfast smoothie addict. Never do the bananas-and-honey thing, though, so I think it’s time to try it. I’m going to try making this the night before because, yes, those extra two minutes of sleep DO make all the difference! This sounds so healthy yet delicious! Umm, yum! I have never tried adding dates to my smoothies, but this one sounds delicious! I need more smoothie ideas, so thank you! And since you declared this the best EVER, I must try it very soon! Girl, you had me at almond butter and almond milk let alone raw honaaay! She looks mighty delish and I need one when I wake up later this morning. I have everything on hand including the dates. (Munch on those things like candy!) By the way…we say “Fraaaaaanch Toast” the same way. (Thanks to Leslie Mann in 40 Year Old Virgin, LOL!) I may put some nutmeg in mine. 🙂 Thanks for sharing! I love a good breakfast smoothie, this recipe sounds delicious! i’ve never had honey in a smoothie but love the idea! That sounds awesome – I love the flavor combo! I am definitely in need of some new smoothie ideas and I looooove me some raw honey. Not to mention bananas. And almond butter! Sitting here drinking this smoothie as I type. IT IS AWESOME!! I didn’t have the dates on hand. The kids and I are tearing it up! Thanks for a great recipe! This looks amazing! One question, what is sprinkled on top? So do you add granola? The picture looks like it. I’m allergic to nuts so what substitute for almond butter?? I just made this and YUM! I altered a few things. I used fresh, raw milk instead of almond milk, I only used two frozen bananas, and I omitted the honey. I like honey, but after tasting the drink with the dates already in it, I found it sweet enough. I also made mine with half a scoop of chocolate protein powder. Thank you for posting this. I hate making breakfast in the morning. I just want to eat and get on the go. This is going to be a perfect breakfast meal this week. You’re awesome! Hi Naomi. Thank you so much for your sweet comment 🙂 Your alterations sound delicious and I’m so happy to know you’re enjoying this smoothie recipe. This is the most delicious smoothie I have ever had! I will definitely keep the recipe around for the future! It made theree 10 oz servings. I meant three not theree! How many servings is this recipe? Excited to try! This smoothie is delicious. I also added raw almonds. Just wanted to give you a heads up before you get angry comments that should NOT be directed at you there is a link to this smoothie on the rocketts fb page claiming it’s vegan. It sounds delicious BTW! !